Today we’re going to make… Hot Pock-ets. If you haven’t heard his Hot Pocket routine, then you should just take a moment right now (video above). It does not disappoint. However, I beg to differ on the hot pockets. I ate a hot pocket just now and I feel great. I made a low carb version with a mozzarella and nut flour crust and it was completely delish. And on my diet. These low carb hot ham and cheese hot pockets are pure comfort food. 2. Put the grated mozzarella cheese and cream cheese into a medium sized bowl and microwave for 1 1/2 – 2 minutes. Remove and stir until creamy and smooth. 3. Crack the egg into another medium sized bowl and beat. Add the melted cheese to the egg and stir to combine. 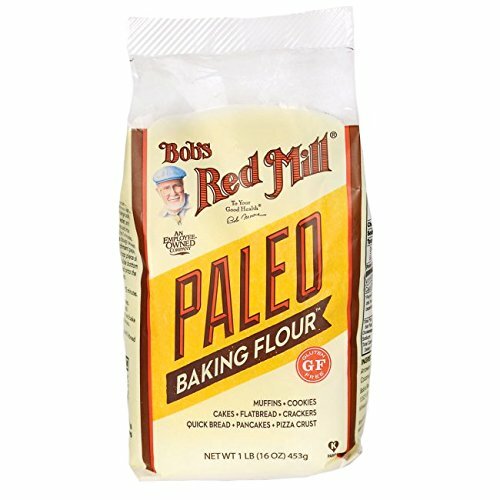 Add the Paleo Flour and baking soda. Mix with a wooden spoon until thoroughly combined. You’ll need to use your hands at the end to bring the dough together. Let the dough cool for a few minutes. 4. Cut two sheets of parchment big enough to cover the entire bottom of a large sheet pan. Roll the hot pocket dough between the two. Roll out the dough until it is almost as big as the parchment paper. Lift the top piece of parchment off and patch the corners to get an even rectangle. 5. With a large sharp knife, cut the dough down the length, cutting it in half. Then cut the dough along the width: once in the middle, then once on either side to make 8 smaller rectangles. 6. Cut the ham and the cheese into rectangles that cover half of each piece of dough. 7. Carefully fold the top of each rectangle over the filling and press the seams closed. Make an egg wash by beating one egg together with a teaspoon of water. Brush over the tops of the pockets. 8. Bake for 18-20 minutes until golden brown. If you liked this Fathead dough recipe, then you might like my recipes for Chocolate Babka, Chocolate Rugelach Cookies or Mushroom Crescents. I only have coconut flour or almond flour. Can either one of these be substituted for the Paleo flour? I used to LOVE hot pockets. So happy to find a low carb recipe for them.